Crime Clusterf@$k/ Political Pantomime 22mts, 6dys: 7 Pillars of Fuel Finds! Before I hit vex mode, let me greet my Spiritual Baptist Friends and Family this morning and ring a loud bell! I can't tell all yuh the last time I see a PM so relieved to be able to say her govt find oil! If I didn't know better, I'd say Kamla led the exploration effort herself. In that press conference yesterday all she aint do is ring ah bell for freedom and justice and pure happiness! For a PM leading a government that promised to diversify the national economy, (because in in May 2010 she said, continuing the focus on our critical need for economic planning and development, our dependence on oil and gas and the unhealthy imbalance this has created makes our economy very fragile) her giddiness over the the Jubilee Discovery has me wondering what, prior to that fuel find, was Kamla and Dookeran (remember him? the finance minister?) planning to do about the current economic stagnancy that the country is experiencing? Rumour has it that yet another business is closing down in Trinidad....a clothing giant....you can find their outlets all over Trinidad. I wonder how this oil find going to assist these workers who find themselves on the breadline now. 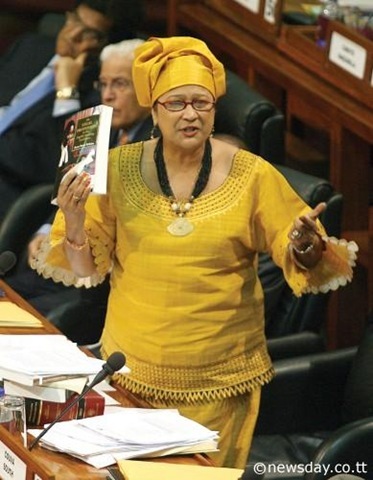 So, Kamla's Giddy Gladness over the fuel find...the God is ah Trini comment had me trying to remember what she said in 2010 about what this government had in store for this country....Anybody remember the 7 Pillars of Development that this government claimed was their NEW POLITICS and new style of governance? the PM announced no squandermania....so Toppin, Vidwattie Newton, Gibb's Crop Duster rental....what are these???? Investments? Let's look at them briefly and you think about whether or not you the Govt doing anything it promised to do. Kamla gave a speech May 14th, 2010, and began her speech, in much the way all speeches by her govt are begun 2 years later....blaming the PNM. Here are some of her opening words: "
The PNM has governed this nation for nearly 40 years since 1956. And their model of governance is now outmoded and outdated. It is ill-suited to confront the myriad challenges that now threaten the very foundation of our economy and way of life. The oil and gas based economic model of development is now on shaky ground. The recent volatility in the markets and consequential strong fluctuations has revealed the vulnerability of our economy. This lopsided approach to economic development is fundamentally flawed and is in urgent need of revision. So, according to the then Opposition Leader, soon-to-be-PNM, we needed to move away from a fuel-based economy because it is a lopsided approach to economic development! very foundation of our economy and way of life. The oil and gas based economic model of development is now on shaky ground. The recent volatility in the markets and consequential strong fluctuations has revealed the vulnerability of our economy. This lopsided approach to economic development is fundamentally flawed and is in urgent need of revision. We aint reach the 7 pillars yet, eh....we aint start to touch them yet....now study your head good and of those 5 areas that improvements were promised how many areas have been even touched? People Centred Development : after the fuel find yesterday, the PM immediately started talking about how this will improve the life of the man in the street. How has public funds been used to help the man in the street? Currently it helps the PM's Family, Friends, Cronies.....not the man in the street...it's not likely to change. Maybe this is what was meant by people centred development...I'll look after my people! Kamla says: We intend to create a knowledge-driven, technologically proficient society that will be the core and engine for a competitive and sustainable economy. Our manifesto will build a new society from the bottom up because we have seen the damage inflicted by the PNM’s top-to-bottom approach to economic development. Poverty eradication and Social Justice: I don't know that I even need to say anything in this area. The Trinidad Guardian is doing a report on poverty in Trinidad these days. It's 2 years into their governance and the Government can't even seem to table the Children's Bill. Glen Ramadharsingh's Ministry of the People (what on earth is that) seems to only plan weddings or hand out hampers. There is poverty in Trinidad and Tobago, regardless of ethnicity and there is no social justice...or movements for it! Kamla says in her speech: Our plans and policies therefore aim to better the quality of life and raise the standard of living for all. They aim to reduce poverty and crime and deliver services to the people in an efficient and professional manner...we will create a Ministry of the People that will be dedicated to ensuring a free flow of government services to the people. Most services should, for example, be accessible on-line, from the comfort of your own home. National and Personal Security: Kamla says: There is also no point in creating economic wealth if people are afraid and unable to enjoy it. The terrifying crime crisis that has engulfed our nation has virtually prevented citizens from enjoying the fruits of their labour. We shall overhaul the criminal justice system to make it efficient and effective. This will be a major deterrent and weapon in the fight against crime. Criminals must respect the law. I would like to see a trial finish within 3-6 months of a person being charged so that criminals cannot make a mockery of our justice system and law-abiding citizens can feel the system is working. In light of this Kamla created the Minister of Justice. What has Herbert Volney done with his term in office thus far? Information and Communication Technologies: KPB says :Affordable internet access for every citizen will be a priority as we seek to create an educated society that is poised to compete with the rest of the world in the 21st century. IT will be infused into every sector of our economy. We will thus encourage and develop strong linkages among our creative sectors, technological sectors, design sectors and our education and academic sectors. In light of the fact that TSTT can't even get it's 2G data service to blackberry phones under control, I am really not holding my breath on ever seeing this pillar erected, much less coming to fruition. More Diversified Knowledge Intensive Economy......i laughing folks.... because KPB said back then: We have immense untapped potential in agriculture and we intend to place the accent on food production and food security. We should be aiming to export food, instead of importing it! ...our Industrial Policy will identify the areas into which we will diversify the Economy including : knowledge based Industries, Cultural and Entertainment Industries, Ethnic Products, Food Processing, the Maritime Industry, Services Industries, biotechnology, information technology, high-tech manufacturing, pharmaceuticals, food production, processing and alternative energy and third and fourth generation renewable energy industries. The diversification of our economy for sustainable development will be a top priority of the People’s Partnership government. Tobago’s economy will be given special treatment because the fundamentals are different. A major initiative will however, be the regularization of land titles for Tobagonians so that they can own their land and gain individual economic independence. A Strong Foreign Policy: back then KPB said: ... our voice must be heard as part of a wider Peoples Partnership that is based on mutual interests and objectives to advance common cause. We see the international arena and the world system as an opportunity to build diplomatic partnerships that can lead to trade and cultural exchanges. I wonder how much of her current international travel is fulfilling this. As you pondering where them 7 pillars are, where they going to be, and if is Grecian or Roman in style....remember that Moonilal just yesterday self in under the protection of Parliament, accused a former HDC head of abusing the Govt Credit card. Now Noel Garcia has responded asking Moonilal for the credit card records. Is either Moonilal uses his privilege in Parliament to lie...or he is the most misinformed Leader of Government business ever and misspeaking, misquoting and general misinformation is the only way he knows to operate. The PM needs to do something about Moonilal. This is the same man who told us that a concrete bunker of diesel and cache of guns was under Beetham....he's also the man that told us the government had bought a plane for surveillance to find squatters...and then it turned out Dwayne Gibbs had rented a crop duster....anybody remember Gibbs and the plane? Remember it was being probed? Remember Anand was supposed to get a report on it...and he did...what every happened to that issue? because Gibbs still here...where the plane? Where the $.9m. Anyhow, why I hotting up my head. We cyah escape them Petrotrin ads for the next week. All we problems solved...ent Kamla? You even sure when the country will start to experience the benefits of the find? Blue skies ahead, right? Because God is ah Trini...ent!